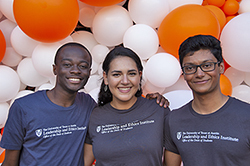 The University of Texas Leadership and Ethics Institute (LEI) is a centralized, comprehensive leadership-training program for enrolled undergraduate and graduate students studying in any academic college, school or unit. Coordinated in the Office of the Dean of Students, LEI offers an array of experiential opportunities for students that incorporate both theoretical and practical ethical leadership development. The purpose of LEI is to prepare the next generation of individuals to act responsibly, to improve the quality of student and campus life, to serve as peer mentors and to serve the communities in which they live, study and work. The LEI Student Leadership Team and Committee members collaborate with the professional staff to coordinate LEI programmatic initiatives.